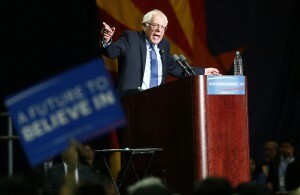 WASHINGTON — Bernie Sanders needs some big-time support, fast. An AP analysis finds that he must win 66 percent of remaining delegates through June to erase Hillary Clinton’s lead following a disappointing performance Tuesday. That’s a herculean task requiring landslide-sized victories in big states and winning over superdelegates who have shown little interest in supporting him. So far, he’s been unable to do either. Clinton’s victories in four of five states Tuesday left her with 1,132 pledged delegates won in primaries and caucuses. Sanders has 818. Clinton’s lead is even bigger when including superdelegates. When including those party officials, Clinton’s lead is 1,599 to 844, giving her two-thirds of the number she needs to clinch the nomination. SUBSCRIBE: Get the analysis of Mark Shields and David Brooks delivered to your inbox every week.